on the farm with us again this year. and wish you all a very Merry Christmas and a Happy New Year! by many to be the traditional Christmas tree. This variety is not available in pots as a living tree . is wonderful for showing off precious ornaments and is grown in a narrow style on our farm so it is easy to move in and out of your home. For 2018 we have a very limited supply of Fraser Firs and we sell them for $65 (cash only, includes tax) regardless of size. These trees possess a unique appearance from other species. With their thick, symmetrically arranged branches Nordmann Fir are perfect for displaying heavy or large ornaments such as glass or heirloom pieces. 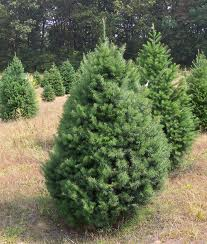 Nordmann Fir trees will have little or no needle loss throughout the holiday season as their dark green needles are short, smooth and covered with a waxy cuticle which prevents water loss. They also have a subtle light blue underside which lights up the appearance of the soft layered needles. 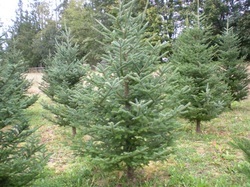 We have a very limited supply of living Fraser Fir and Nordmann Fir trees in 5 gallon pots. These trees range from 3 to 5 feet. Living Trees in pots sell for $100 (including taxes -cash only).